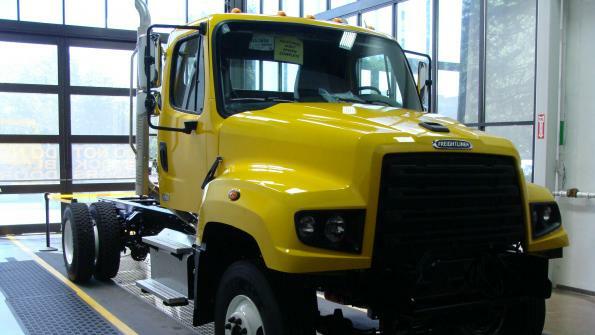 The North Carolina Department of Transportation has ordered 67 Freightliner 114SD severe duty trucks for its fleet. All of the trucks will be manufactured at the Freightliner Mt. Holly Truck Manufacturing Plant in Mt. Holly, N.C. The North Carolina Department of Transportation (NCDOT) has ordered 67 Freightliner 114SD severe duty trucks for its fleet. All of the trucks will be manufactured at the Freightliner Mt. Holly Truck Manufacturing Plant in Mt. Holly, N.C. Equipped with Cummins ISL9 engines built in Rocky Mount, N.C., the 114SD trucks will be used for a variety of applications throughout the Tar Heel State, including refuse hauling, snow plowing and road repair. In total, NCDOT specified 15 different 114SD vehicle configurations. In addition to the 114SD and Cummins engines, NCDOT’s new trucks will feature dump bodies and snow removal equipment manufactured by The Godwin Group in Dunn, N.C. The Godwin Group is a truck equipment manufacturer. The firm has partnered with NCDOT for more than 30 years. Additional North Carolina-based partners include: Meritor driveline components from Fletcher, Forest City and Laurinburg in N.C., and Manning and York in S.C.; and axle components and structural plastics from ConMet in Monroe and Bryson City, N.C.
Terry Keith, vocational truck sales manager and his team at the Freightliner Charlotte Truck Center in Charlotte, N.C., reviewed the specifications and submitted the winning bid to NCDOT. For more information, go to this site. Freightliner Trucks is a division of Daimler Trucks North America LLC, headquartered in Portland, Ore., and is a heavy-duty truck manufacturer. Daimler Trucks North America produces and markets Class 4-8 trucks and is a Daimler company, which is a global commercial vehicle manufacturer. In the video, Freightliner’s Brian Daniels talks about the range and capabilities of the Freightliner 114SD with Cummins Westport ISLG natural-gas engine.